Pelikan has been manufacturing a variety of goods since 1838 and almost all of those products have been backed by advertising of one form or another. Consequently, Pelikan has produced a tremendous amount of ephemera, enough to keep a collector busy for a lifetime. I invite anyone interested to check out “Pelikan – The Brand” by Detmar Schäfer and “Deutsche Werbegeschichte – Am Beispiel Günther Wagner – Pelikan” by Heinz Rings for fascinating accounts of Pelikan’s advertising over their nearly 180 year history. Pelikan has employed various displays to draw attention to their products in order to make a sale. One such display has always captured my imagination and, to me, is the epitome of Pelikan advertising. 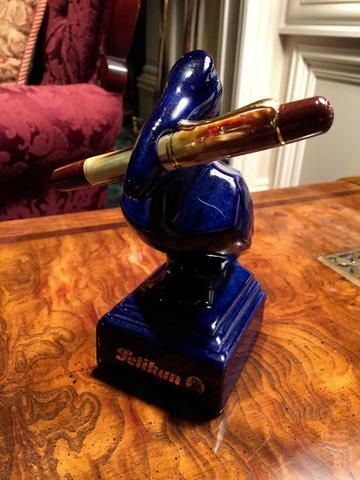 Since the 1930s, the company has been creating figurines in the form of a pelican in support of its fountain pen sales. These are usually made of ceramic but have been crafted from other materials over the years. The initial versions were a cadmium yellow and promoted sales of the model 100. 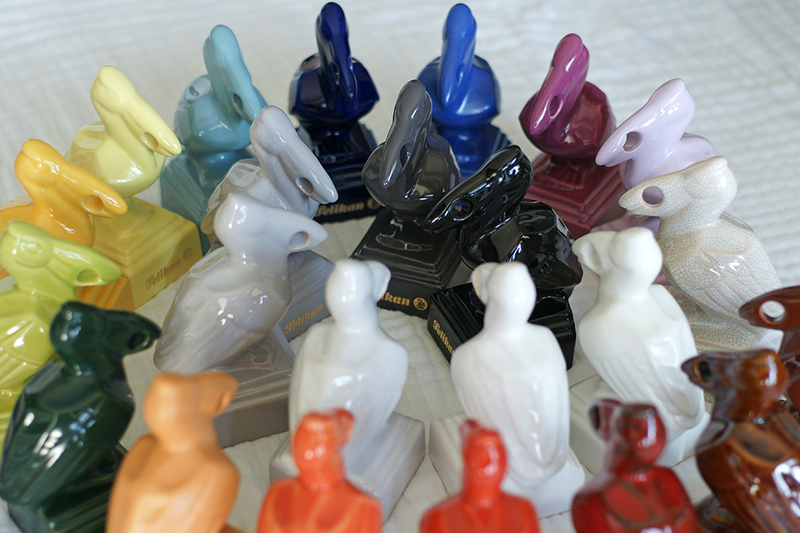 Designed for display in shopkeeper’s windows, the figurines have attracted a following and have become quite collectible. The older pieces are incredibly difficult to come by but there have been more recent versions that were released to German dealers after the M400’s introduction in the 1980s. These pieces can be found a bit more commonly, most often in white or cobalt blue. 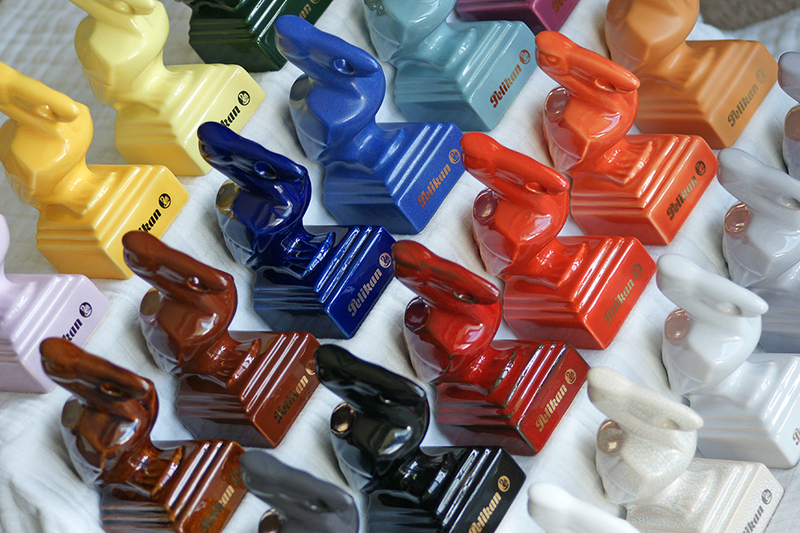 It is a lesser known fact that these figurines enjoyed a much larger variety of color which is what I wish to share with you today. 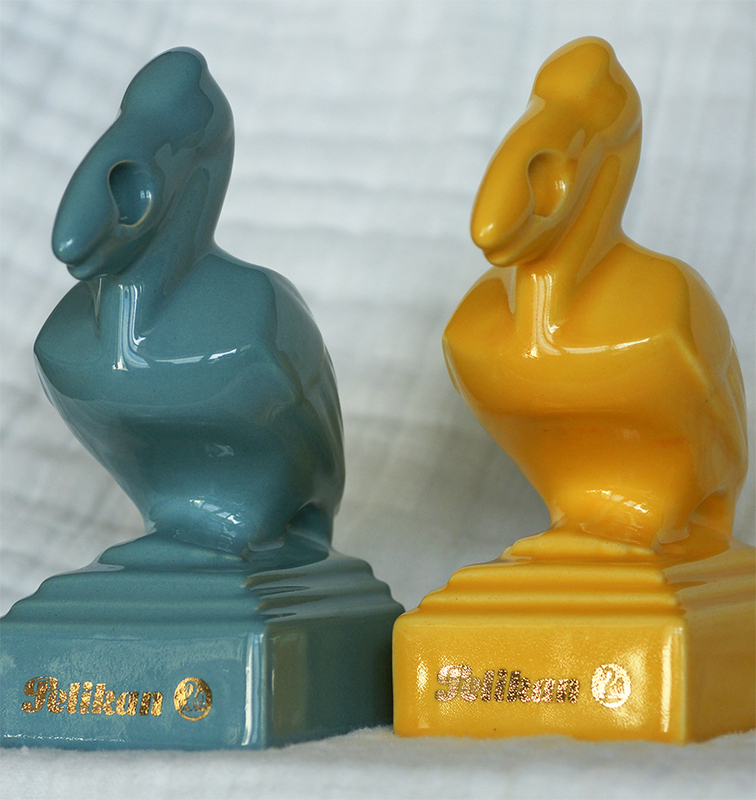 What little is documented tells us that cadmium yellow ceramic pelican pen stands were first employed in the mid-1930s as a means of symbol based advertising. A large version with a hole in the beak for holding a pen measured 5.9 inches tall while a smaller ceramic measuring 5.1 inches was for decoration only as it lacked the beak hole. In the 1960s, Pelikan embraced bold red colors with their sales materials and ceramics of that era are seen in white with red accents. Those older stands had the company name emblazoned across the front of their base. While the basic design of these pelicans didn’t change much, you’ll find several variations on the theme. Fast forward to the year 1988. 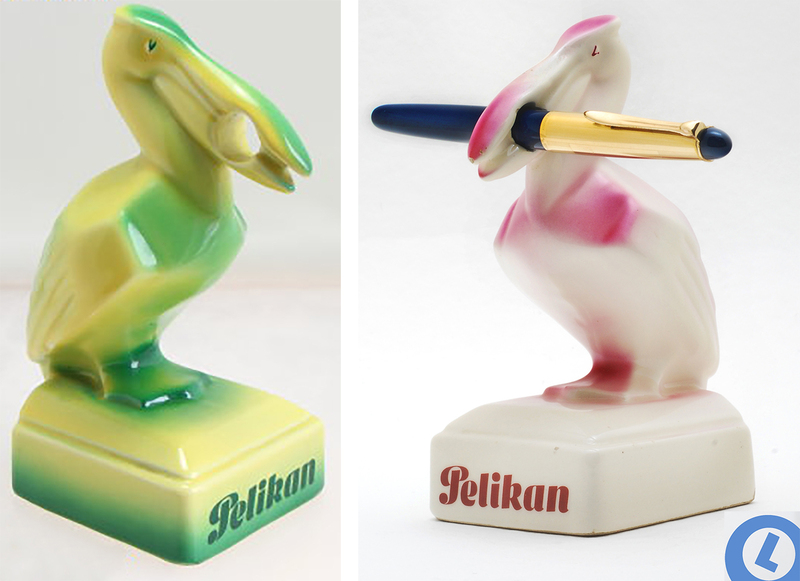 Pelikan was celebrating the 150th anniversary of the company and a kit was sent to retailers which included white ceramic pelicans, with and without beak holes, for display. Some of these were also distributed at trade fairs in Germany. 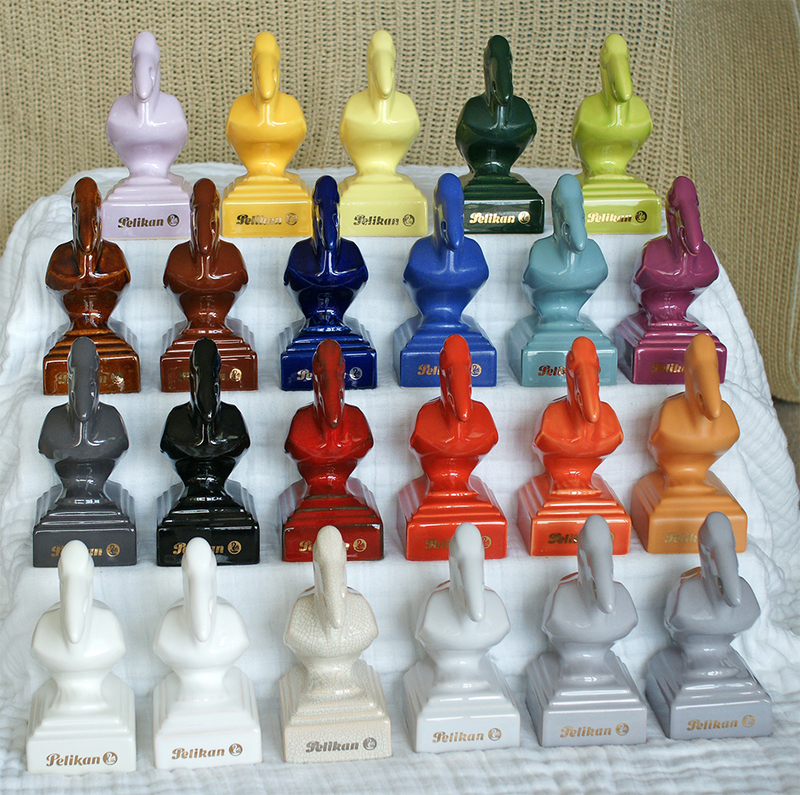 While we see these pen stands in white most commonly, there actually have been an abundance of colors produced. 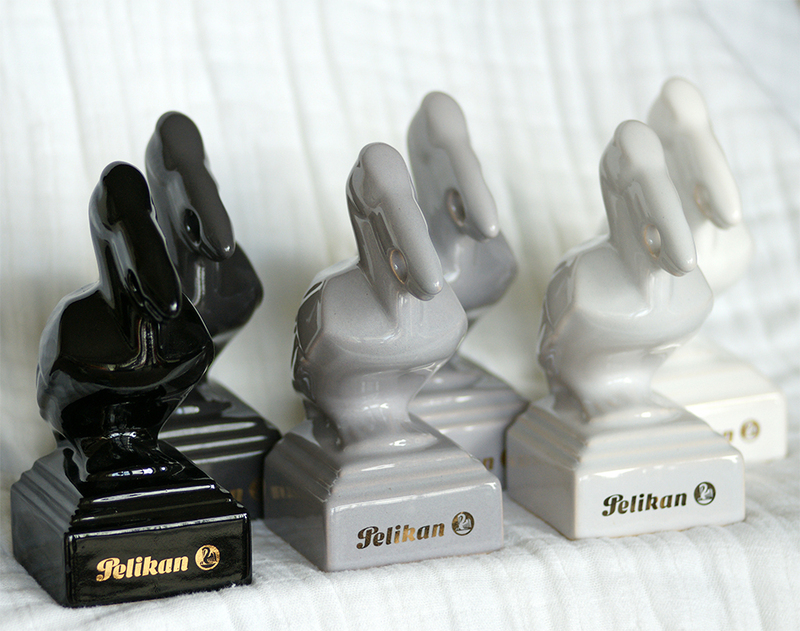 These stands not only include the Pelikan name along the base but also the company logo done in gold. The exact details surrounding these figurines are unknown but if you’re persistent, patient, and willing to meet a seller’s premium pricing, you might get a chance at owning one. These tend to be the models produced in the 1980s & 90s and are the ones that have most captivated me over the years. They are 6.5 inches tall and have a base that is roughly 3 inches square. The underside lacks any indication as to who manufactured them. They have been produced in a multitude of colors, the brightest of which have largely only been available to the German market. The beak holes can vary in size with some accommodating an M800 whereas others cannot hold anything larger than an M400. 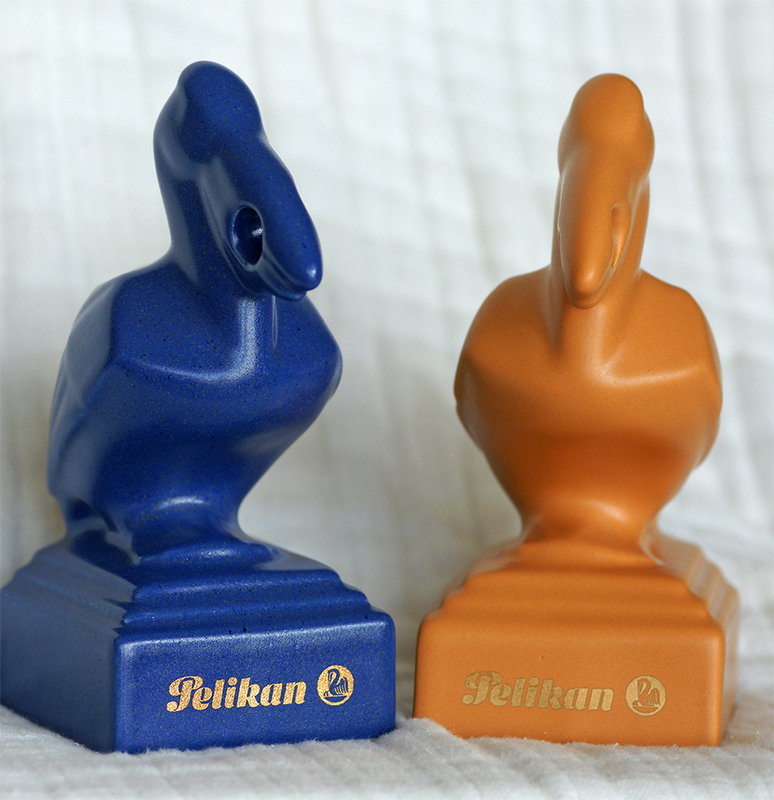 These colorful versions invariably display the Pelikan two chick logo, indicating production prior to 2003. The white version is still produced and available for purchase from several retail outlets. Those contemporary stands, of course, have the current one chick logo painted across their ceramic base. While only little more than 1/2 an inch shorter, we’ll declare these next figurines to be “medium sized” for the sake of discussion. The older versions of these pen stands, those from the 1930s through 1960s, fall into the medium sized group and are incredibly hard to come by. They will generally command a very high price if you are able to find one. I have seen the red/white version from the 1960’s stamped “IKA, Wunstorf, Western Germany” underneath to indicate the manufacturer. While the cadmium yellow pelican was meant to support sales to the 100, the red/white bird punctuated sales of pens like the P15. Several examples from the 80s & 90s also came in this size and appear to be the rarer of the two larger sizes. Obviously, these do not stand quite as tall as the larger models, measuring roughly 5.9 inches with a square base that is approximately 2.75 inches. 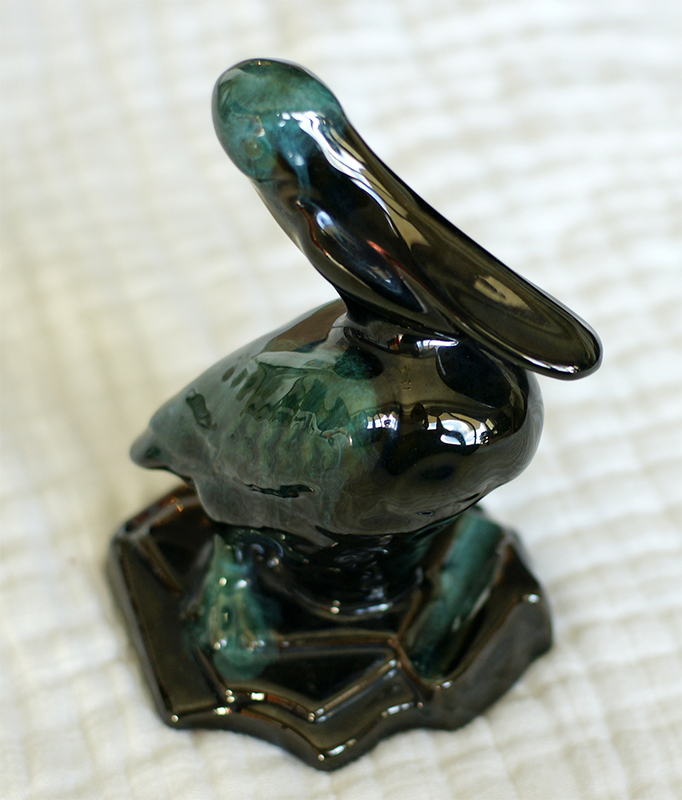 The small ceramics are just 2.5 inches tall and are not big enough to accommodate a bird in the beak. These are equipped with a pen tray in front of the pelican, large enough for a single pen. Four colors have been produced over the years. The white version is the most common and is further distinguished from the others because its base is a just a tad bit longer. I have heard that the cobalt blue version was released in 2003 alongside the M405, M605, and M805 solid dark blue fountain pens. The gold and silver versions were reportedly launched in 2004 as part of the 75th anniversary celebration of Pelikan’s pen manufacturing. This is a bit of a departure from the above stands. It was made for Pelikan by Blue Mountain Pottery (1953-2004), a Canadian company known for their trademarked special glazing process. Their creations in general are quite collectible, this pen stand being no exception, but the company is now long out of business. This ceramic measures approximately 6 inches and has a tray at the base to hold a single pen. 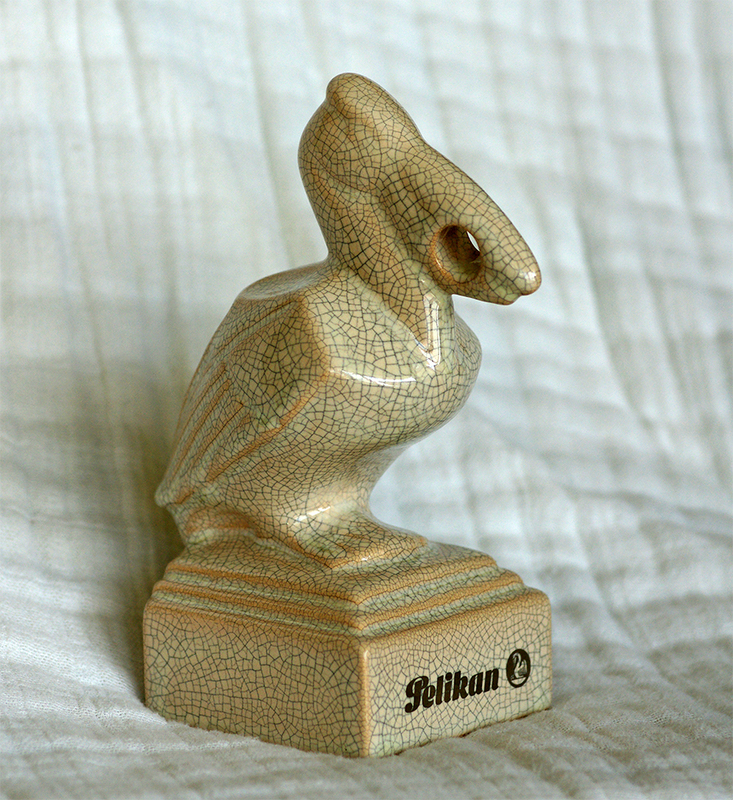 Pelikan has produced many other ceramics over the years, an accounting of which would be beyond the scope of this post. Most of those creations, however, were not designed to hold a pen. These were advertising or promotional pieces, items meant to be given away as corporate gifts to vendors and good customers. Many were used to commemorate an anniversary of one type or another. Heinz Rings’ tome highlighted above is perhaps the best account of these that I have ever encountered. What are your thoughts on these colorful birds and have you seen other interesting colors not discussed here? Feel free to join the discussion and leave a comment below. Currently, only the white one is for sale which is a shame because these colored birds are true beauties. At the 2015 DC Show, I was fortunate enough to find one of the cobalt blue ceramic Pelikans. Here it is with a vintage 101N. Most of the time it holds my M250 Levenger Brown Tortoise, which is a pretty rare bird as well. A beautiful bird with an even prettier pen. That’s a nice combination there. Thanks for sharing! I wonder if the one you call “speckled” is merely a case of the ceramic glazing beginning to crack..? Is that a possibility or does it truly look like it was designed that way? I had the very same thought when I first saw the “speckled” pattern. Then I saw it in a few different places with the same pattern. It also doesn’t have the usual look of cracked ceramic glazing. After seeing multiple examples in a very similar pattern, I came to the conclusion that this was by design. That said, there isn’t any documentation of these readily available so it’s impossible to know the truth. Regardless, the look is an intriguing one that I enjoy tremendously. 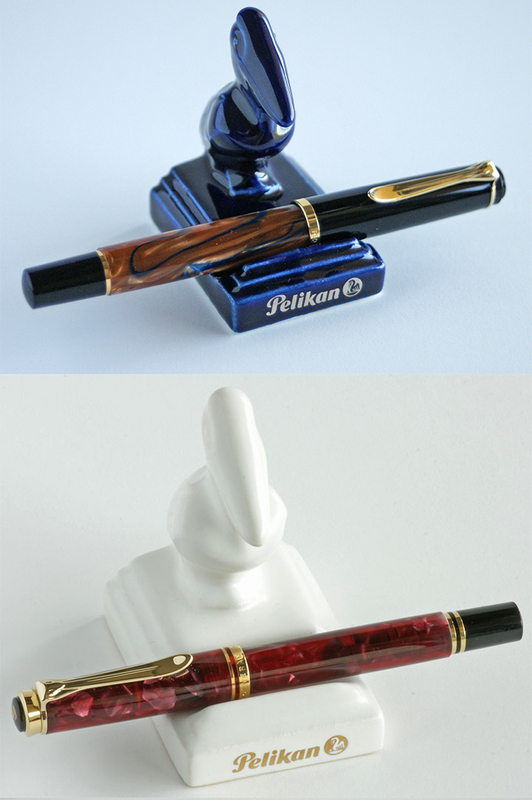 Recently I saw a nicely wood carved Pelikan Pen Stand with a Pelikan Fabrikate sticker at the bottem. I would guess this was made in around the 1930s. Do you perhaps have any information about these wooden Pen Stands? There have been literally countless pieces of ephemera produced, pen stands of all kinds. I have a few wooden ones. They are nice. I would have to see a picture of the one you refer to be able to provide specific input.